Branding: Where should you start? Branding involves more than just a logo or an impactful advertisement. Successful branding communicates brand values across every consumer touchpoint. This includes logo, sales materials, website, advertising, signage, on-site experience, and more. It is a detailed process and professionals are a valuable asset to ensure an effective result. For a strong brand with longevity, collaborate with a marketing agency that has expertise in this area. Where should the branding process begin? The success of business relies on customers. Therefore, successful branding must start with a complete understanding of the target audience. This should include demographic, psychographic, and behavioral information, as well as consumer perceptions about your product and those of competitors. Develop a mission statement. This is not your catchy slogan or tagline. A mission statement clearly defines the company passion and purpose. It will guide the company’s policies, actions, and goals. Every design, copy, and advertising element should clearly reflect the mission. The brand name and messaging should work cohesively with what the target audience wants and needs. These should also reflect the company identity, values, and mission. What makes your product or service unique? How does your brand stand apart from competitors? Will your target audience feel a connection to your brand name and message? Each step in the branding process builds upon the others. Every element works together. Design elements are no exception. 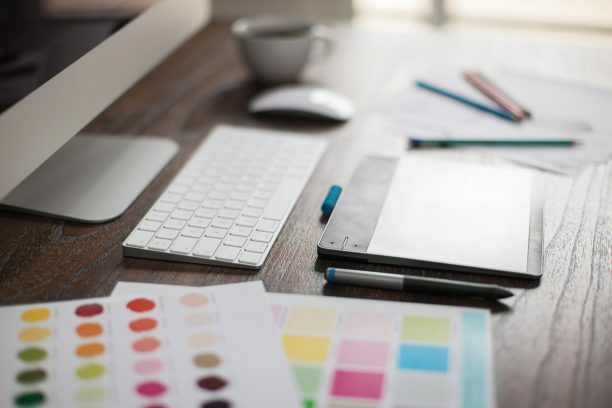 The look and feel of all materials – including website, brochures, business cards, letterhead, advertisements, social, and more – should have the same voice and appearance. Color selection is just one example. Color has emotion, so do the brand colors make sense with what the audience should feel? Is color used in the same way every single time? If the company name is on it, it is branding. Style guidelines should be in place to ensure that every mention of the company name, every logo placement, every communication delivers the same promise. Whether you are working to rebrand a major organization or launch your startup business, begin with the “who” and the “what.” Who are you? What is the promise? The branding process is not complex in itself, but it does require complex discussions. Follow decisions with branding consistency across every piece and touchpoint. Engage a professional to assist with the process to get it right the first time. id8 is a full-service marketing agency in the suburbs of Atlanta, Georgia. We would love to discuss your branding needs, so give us a call or stop in and say hello.